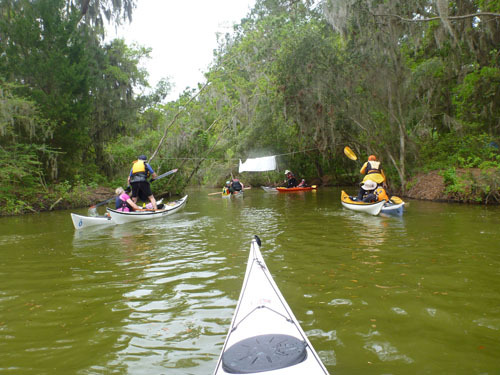 A few days ago I returned home from the East Coast Paddlesports and Outdoor Festival, which is an awesome event that takes place in James Island County Park, located in Charleston, South Carolina. This was my second time instructing at this event, and both times I’ve found South Carolina to be unique and wonderful. Vendor booths around the lake. I arrived at the event early, and spent some time exploring. It was the first time in months that I’d been somewhere warm enough to wear shorts, and I enjoyed a leisurely stroll through the park. 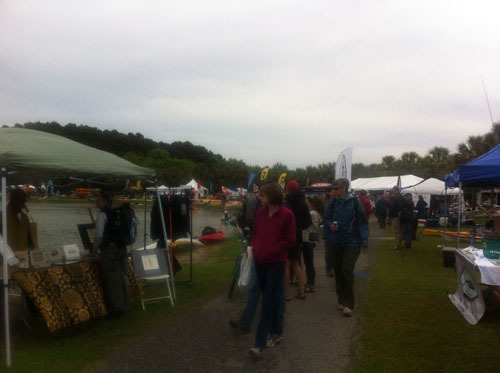 The event started on Friday, April 19, and after instructing Fun, Balance and Games in a warm lake, I made my way around the many vendor booths to catch up with people, meet people and check out the latest in outdoor gear. 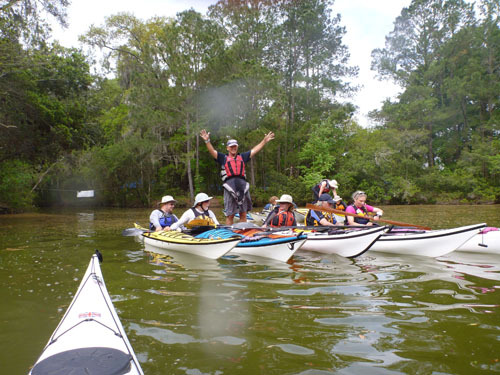 The event had some extra attractions this year, which included rock climbing, mountain biking and archery. On Saturday I instructed Advanced Greenland Rolling with Dubside, and the class had a blast learning new rolls in the warm water. On Sunday I instructed Simplifying the Roll, and despite some wind, we were able to find a calm corner to roll in. 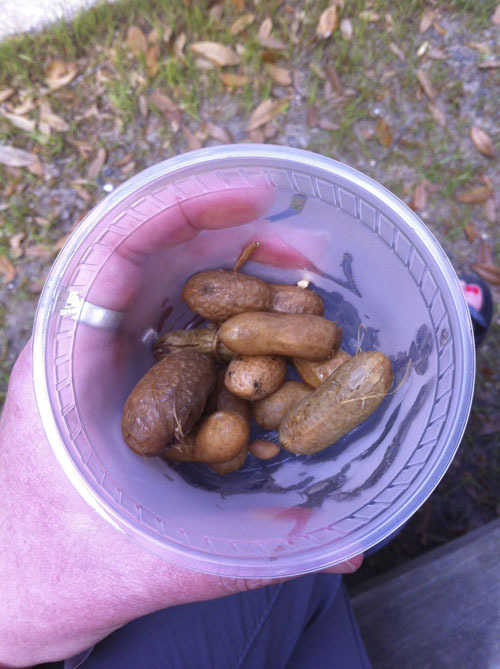 Boiled peanuts, a tasty South Carolina treat. Evenings were spent socializing and eating tasty southern food, and there was no shortage of demonstrations and presentations to watch. 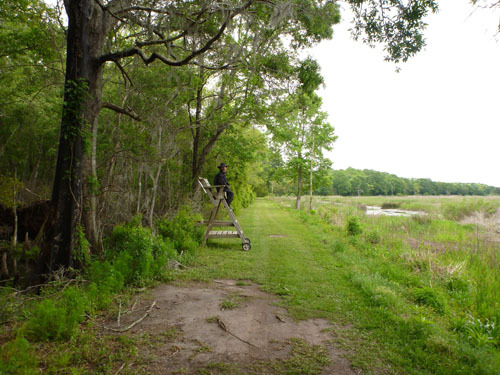 Dubside looks for alligators in the rice fields. On Monday I instructed private rolling in the lake, and Tuesday was play day. Event organizer Diana Belknap took me and Dubside out for a really fun day. 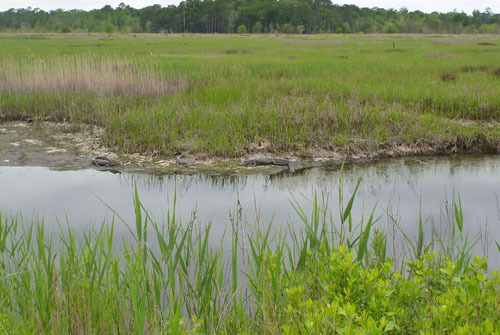 When asked what we wanted to do the decision was mutual… find alligators. Diana thought this was funny, but found us alligators, and we made our way around the rice fields, spotting 13 of the magnificent reptiles. A mother alligator enjoys the afternoon with her three offspring. After a fun afternoon of alligator hunting Diana had more treats planned for us, and we ended up at the McLeod Plantation, which she is the caretaker for. 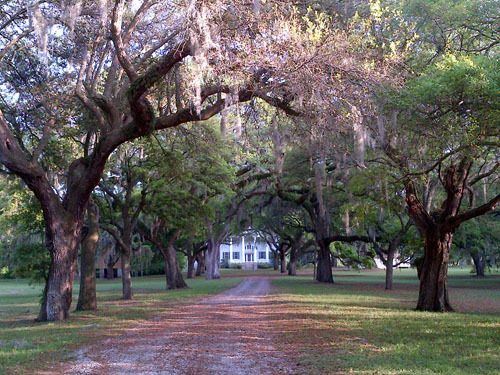 We had the opportunity to explore both inside and outside the plantation, which is currently under study and restorative repair. It was wonderful to explore a place with so much historical significance. Thank you to all of the organizers, and especially to Diana for taking such good care of us! 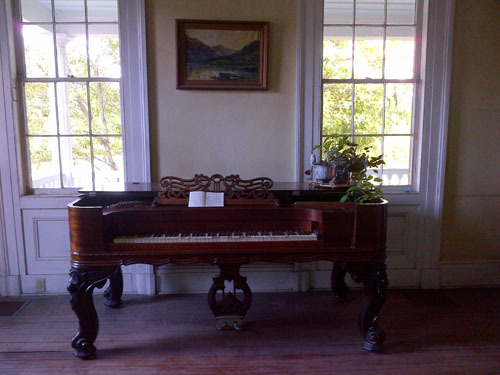 A very old grand piano adds personality to one of many spacious rooms. Pictures by Helen and Diana Belknap.